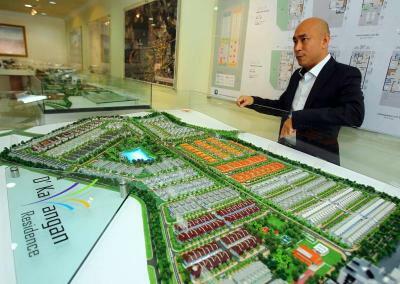 Well-designed: Noorazhar showing the model of the D’Kayangan units. HYPERLINK Marbella homes in D’Kayangan, Shah Alam offers buyers the comfort of living in a low-density residential area. The project will be developed under phase six of the D’Kayangan township and each unit is 28’ x 80’. Kumpulan Lebar Daun executive director Noorazhar Mohamed Nurdin said only 102 homes would be built for this phase. Noorazhar said each unit comes with a built-up area of 3,085sq ft. He said the development is expected to be completed by August 2013. “The hyperlink Marbella type A homes are spacious and built without borders,” he said, adding that the type B homes would have a built-up area of 3,368sq ft.
Noorazhar said the strategic location of the project itself was an unique selling point. It is located at the former site of the Batu Tiga race course, he said, and was easily accessible via the NKVE, Elite Highway, GCE, Kesas, LKSA and KL-Klang Federal Highway. “It is a gated and guarded community with perimeter wall fencing and a 24-hour security under a conducive environment. “There are hypermarkets, education centres, shopping malls, sports facilities as well as golf courses near the site,” he said. Noorazhar added that the development also comes with a scenic lake within walking distance. He said the homes priced between RM958,888 and RM2.2mil were ideal for investment. “We are confident that the homes will attract good response from investors and those who seek to upgrade their lifestyle,” he said. A 3% discount is offered for the hyperlink homes to early birds for limited units only, buyers could enjoy savings of up to RM70,000. Besides the Marbella, D’Kayangan Residence Semi-D type Alena (40’x 80’/50’ x 90’) and Semi-D Villa type Casa Ariana (60’ x 80’) are also available for sale. A commercial project consisting of shop office and service apartment are among the other developments expected to be launched at D’ Kayangan this year. The D’Kayangan township with a land area of 66ha comprises superlink and semi-detached homes, bungalow lots, a recreational and commercial centre. PETALING JAYA: Five parcels of freehold land in the Klang Valley owned by the late Tan Sri Lee Yan Lian's family have been put up for sale by tender. He is renowned for developing SEA Park in Petaling Jaya and Taman Tun Dr Ismail (TTDI), which was a joint venture with the Urban Development Authority. Lee's SEA Housing Corp Sdn Bhd owned the 286ha of rubber estate land which was developed into the highly successful TTDI, an affluent township in Kuala Lumpur. A property developer, who requested anonymity, said that the Lee family still owned a number of land in the Klang Valley and the five pieces advertised for sale were among the more prime parcels. “These are among the last sizeable freehold land in the Klang Valley and will be suitable for redevelopment into mixed development projects,” he added. In the latest sale tender, a 7,239-sq-ft land in the prime location of Jalan Bukit Bintang, Kuala Lumpur has a reserve price of RM50mil. The land is currently occupied by The Malaysia Hotel. The second piece measuring 276,832 sq ft in 4 miles Old Klang Road (near the Pearl International Hotel) has a reserve price of RM90mil. The other three parcels are located in Petaling Jaya. The tender package can be purchased from Colliers International Property Consultants Sdn Bhd, the property agent appointed for the tender exercise. A tenderer may purchase the individual property or all five properties. The last date for purchase of the tender package is Jan 16 and the closing date of the tender is at 1pm Jan 30. UOA Real Estate Investment Trust (UOA REIT) posted a higher pre-tax profit of RM41.87 million for the financial year ended Dec 31, 2011 compared with RM25.08 million in the same period last year. occupancy rates to sustain barring unforeseen circumstances. "The manager will also continue to seek opportunities to further acquire real estate that meets the objectives of the Trust," it added.